I have read a number of books that indicate a surprising lack of basic knowledge when it comes to writing about so-called eco-terrorists. These ‘thrillers’ include fictional characters who are activists engaged in acts of sabotage against, let’s say, laboratories that conduct experiments on animal subjects, urban sprawl, or slaughter houses. The authors of such books frequently choose to ignore the basic tenet of Ecotage and the direct action performed by environmental groups such as ALF and ELF–that is destruction to property and not to human life. 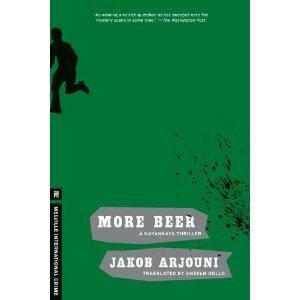 So with those reading experiences in mind, it was simply refreshing to come across More Beer, a German crime novel written by Jakob Arjouni. In spite of some skepticism Kayankaya agrees to take the case. On the one hand, he finds it bizarre that ec0-saboteurs would end up killing someone, but then to say that these 4 men who were on site to blow up a waste pipe just happened to be there when Fredrich Bollig was murdered by someone else seems to be stretching any notion of coincidence. But there are some things that bother Kayankaya about the case. How did the police catch the saboteurs so quickly? Some eyewitnesses say that they heard shots prior to the explosion, but then supposedly Bollig went to investigate the explosion and was then shot. Kayankaya knows that he must investigate the conflicting eyewitness statements and establish the exact sequence of events and that he must also ascertain who would benefit from the death of Bollig. While some people at the Bollig plant are very cooperative, others are hostile. As the investigation deepens, it also becomes increasingly dangerous for Kayankaya–especially since as a Turk he’s already subject to a large amount of prejudice from witnesses and from the police investigating the case. The proprietress pushed through the brown bead curtain, took my cup away and brought it back with a refill. Her ample bosom was swathed in a ball gown from which her arms, neck, and head protruded like sausages. Her rear was adorned with a purple satin bow, her wrists with fake gold bracelets. Her hair had been dipped in liquid silver. Hertha was the owner of Hertha’s Corner–open twenty-four hours. The place was large, dark, and empty. The dusty bottles behind the bar were lit up by fluorescence. Raindrops rattled against the dirty windowpanes. In one corner stood the table reserved for regulars, with its wrought-iron emblem, a wild sow waving a beer stein. Hertha was rinsing glasses. A fly landed on my mutilated sandwich. I lit a cigarette and blew smoke rings around the fly. Kayankaya discovers more than one skeleton in the Bollig family closet, and it seems as though Bollig’s murder has managed to sway public opinion favorably towards the chemical waste company responsible for damaging the local children. Kayankaya keeps digging and his investigation brings him to the attention of the sadistic Detective Superintendent Kessler–a man whose slight physical presence belies his nasty nature. More Beer, part of a series of Kayankaya mysteries, is written with a light touch of humour with PI Kayankaya mainly amused by the bizarre characters he meets during the course of his investigation. These colourful locals include the heavily-tanned, merry widow Barbara Bollig, and Nina Scheigel, the vodka-guzzling wife of the night watchman. Everyone, it seems, has something to hide. Review copy courtesy of Melville House Publishing via netgalley. In Germany he is spoken of as the German answer to Raymond Chandler. It isn’t completely wrong and I liked his first book a great deal when I read it. Arjouni has also written some books that are decidedly even closer to literary fiction. I think I read the first in the series. Happy Birthday, Türke. Have they published them out of oder in English? They do that quite often with translated series. I wonder why. Melville House has several of the titles in print. This one was offered on netgalley so I grabbed it. It’s the second, I think. It doesn’t feel as though you are out of the loop when it comes to missing the first. Looked on Amazon and they have Kismet, Hapy Birthday Turk! and One Man One Murder. I’d never heard of this writer, so thanks for the discovery. Part of the book’s premise is that ecotage is subverted for political purposes–a rather enlightened view. France has the authors of The Coming Insurrection. I meant that eco-terrorism is not in the DNA of French ecologists. The only violent actions I can remember of is José Bové destroying a MacDonald’s and reaping transgenic corn fields. The Tarnac 9 were arrested for railway sabotage. I’m not sure what happened–if there was a trial or wotnot. The Coming Insurrection is available in Fr or English at http://www.tarnac9.wordpress.com. The author/s The Invisible Committee–although I have read several ideas of who that might be.